Proper Kitten care for an orphaned new born is very essential. Kittens must first be provided formula without lactose; cow’s milk must be avoided at all cost. The formula must be warmed in a bottle or a medicine dropper where the bottle or dropper can be placed in a basin of hot water. Check the temperature to feel if it’s too cold or too warm since the kitten will feel the same thing. Wait a few minutes for the formula to cool down in case it is hot. Ensure that the formula is tested properly before giving it to the kitten. The kitten must be placed at 45 degrees similar to a feeding position similar to when it feeds from its mother and allowed to drink the milk until finished. Hold the kitten with care and ensure that the kitten is not on its back similar to a baby, since a kitten can aspirate formula into the lungs. Refrain from squeezing the bottle and forcing milk to come out. The kitten may not eat the first day; this is not a reason to panic. In case the kitten is not eating after 24 hours, it is best to contact a veterinary service. Kittens may require to be fed through a tube. If this procedure is unfamiliar never attempt it alone. A kitten needs help to eliminate until three weeks old. Use a paper towel or wash cloth and massage the bottom area gently. A kitten can be held over the sink during this time. A general guideline will make it easier to follow a feeding schedule. If a kitten cries it is because it’s hungry. Kitten care requires avoiding overfeeding kittens. Follow the guidelines on the formula box. Once the kitten reaches three to four weeks, you can start weaning the kitten with canned food or baby food. Kittens care also include that they receive proper warmth. If a kitten is feeling cold, it needs to be warmed quickly. Cold poses danger to kittens. The kitten must not be submerged in water since the temperature may get too warm too quickly. The kitten is unable to generate heat. Kittens care in providing warmth requires a kitten to be wrapped in a blanket and be warmed. Provide the kitten a box big enough to hold a heating pad making sure the heating pad is well covered. The kitten will come to rest on this heating pad to get away from the cold. In case a kitten does not have a heating pad they can die of dehydration. Cover the heating pad with a towel and turn it on low. The kitten must not directly lie on the heating pad. Refrain from bathing a kitten unless it is absolutely necessary. The kitten’s body temperature must be 90 degrees when taking a bath. In case of fleas, do some flea combing. If bathing a kitten use some lemon Joy. The citrus will kill the fleas, as flea shampoos can be too harsh. Do not use a hair dryer, but use a towel to dry the kitten. A litter box can be used to train a kitten when you see it scratching the ground. Allow them to scratch the litter box. Kittens love to use their teeth and claws. Give them a scratching corner so that they are able to sharpen their claws rather than on the furniture. Vaccinate a kitten at two months so that it does not contract any diseases. A veterinary service must be consulted immediately. Register your kitten at a local vet which will be helpful even in the future. A kitten loves to play and you need to make ample time to spend with your kitten. Kitten care requires your kitten to be groomed well. 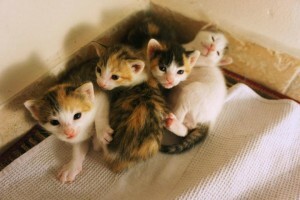 Kittens are very loving and loyal and provide good companionship to people. i just want to know why cow’s milk are avoided..? Are Dutch Lady milk can be given to kitten? Kittens should not have cows milk because it’s high in protein and therefore will make them sick. There is milk you can buy at your local grocery store in the pet section. Its made especially for kittens. Its by”whiskas” and my kitty loves it:). I found this little kitten when I was out walking and now what? I know now that it is a siamese, I don’t have a clue of what to feed it or milk it its about 4 to 6 weeks old, he eats kitty food and i got some Kitten milk at the store she likes that a lot. Should she be drinking water because I cant get her to do it. This is great website. Latifa! WHATTT! Latifa! WHHHAATTT! where can you get a kitten I want one really bad!!!!! I cant find any around here and I really truly want one.